Presented by Crafty College, Bluebonnet Crafters and Flora-Lite Co. Designer and decorative painter Sandy Cheney designed this angel for Flora-Lite and the Web of Angels. The Flora-Lite Company has produced the iridescent plastic globes that can be used on a string of lights or individually with the battery operated power pack. In the area to be painted give the plastic Flora-Lite Ornament a light spray of the matte varnish. This will allow your paint to bond to the plastic ornament. 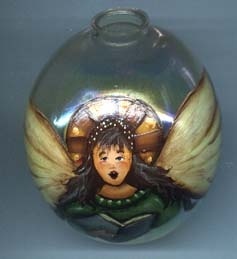 Using the picture as a guide or your own original design paint an angel on the globe allowing it to dry between colors. When your picture is finished and completely dry an additional coat or two or the varnish can be used to seal and protect it. It is better to use two light coats than one heavy coat. The ornament can be used on the tree, in a wreath or swag or as mantle decorations. The instructions for adding the light come in the packages and when lit they provide a pretty glow behind your painted design. Option: If you feel you can not paint well enough to paint your angel, stencils, rub-ons or decals can be used in place of the painted angel. You can add additional embellishments with lace, ribbon, etc. These Flora-Lite Ornament Lights come in a package of 3 and are available at your local craft outlet. If you don't see them ask. If the store doesn't carry them let us know.